PARCO is currently working on our plan for the new Shibuya PARCO. The new Shibuya PARCO will continue to represent PARCO’s brand image as its flagship store in the same way as the previous store, and will contribute to further enlivening the local area. The facility will have a total land area of approximately 5,380m², a total floor area of approximately 63,830m², 19 above-ground floors, and three below-ground floors. We are aiming to open the store in Autumn 2019. In 2014, PARCO formulated a long-term vision with the goal of being ‘a business group that prospers in urban markets’ as part of our Medium-term Business Plan and we are currently advancing business strategies in order to achieve it. Our aim in formulating the vision was to fully understand recent major changes to domestic and international markets as well as to consumer attitudes, and to turn these into business opportunities.. The purpose of the new Shibuya PARCO plan is to strengthen the PARCO brand in order to achieve this long-term vision. Since its launch in 1973, Shibuya PARCO has communicated cultural trends through entertainment and lifestyle proposals for urban consumers and has been the driving force behind PARCO’s brand image as its flagship store. A melting pot of cultures and values, Shibuya is an area rich in variety and individuality. In recent years, it has attracted increasing numbers of international visitors as the center point of a distinctive culture and there are high expectations for its further development as one of the world’s most recognizable urban areas. With various development projects underway throughout Japan in preparation for 2020, the whole of Shibuya district, in which Shibuya PARCO is situated, will change greatly. On June 30, 2015, as scheduled executor the “Udagawa-cho 15 Development Project,” PARCO submitted a proposal to the Tokyo Metropolitan Government for planning of the area including Shibuya PARCO Part 1 and Part 3 as a special urban renaissance district. The Tokyo Metropolitan Government gave public notice of its approval of the project on December 17, 2015. The decision was taken to temporarily close Shibuya PARCO for reconstruction purposes in line with the development plan, and its final day of operation was August 7, 2016. Following a successful demolition, construction of the new Shibuya PARCO officially began on May 17, 2017. By creating the reborn Shibuya PARCO as a global shopping complex for a new generation, PARCO is contributing to the further enlivenment of Shibuya. In addition to a PARCO store, other intended purposes of the facility include offices, business incubation facilities, commercialization support facilities, and cultural facilities such as a theatre. 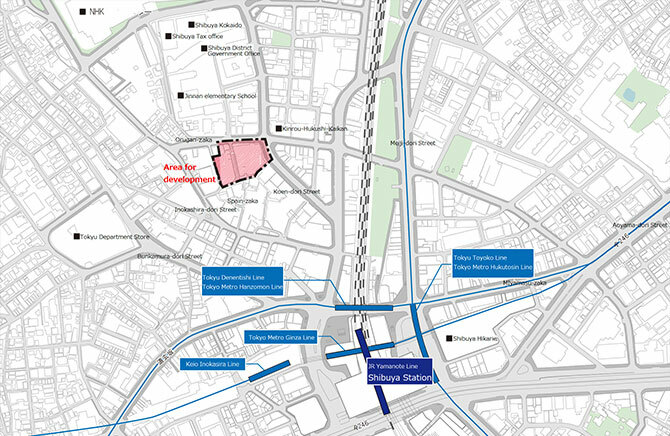 It will contribute by enlivening the area surrounding Shibuya station through the development of a pedestrian network that increases foot traffic and energizes the town, the creation of vibrancy through area management, and the cultivation of fashion and theatre culture and communication of trends. The facility will also contribute to urban revitalization through initiatives to tackle local issues and improve disaster response, such as the provision of communal loading areas, the provision of support facilities for people unable to return home in a disaster, and the reduction of environmental impact.